As super Tuesday began, conservative business man Donald Trump has been under fire for not disavowing David Duke, the former Grand Wizard of the Ku Klux Klan. But what about Hillary Clinton’s record on race? 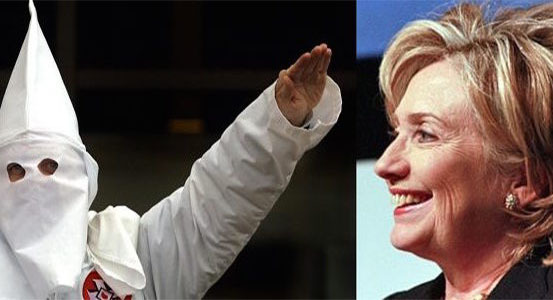 Now, a video has appeared on YouTube of Hillary Clinton speaking highly of a former Klan member. Former US Sen. Robert Byrd (D-WV) was a card-carrying member and recruiter for the KKK. In the 1940s, he obtained the KKK rank of “Exalted Cyclops” and spent decades promoting their vile, racist message. And he took part in what was, at the time, the longest filibuster ever against the civil rights act.